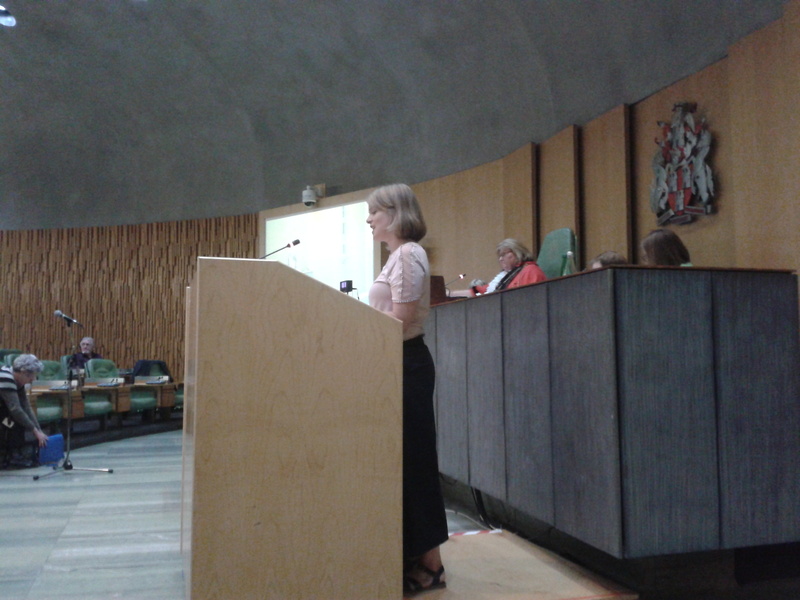 Sally Watson gave a five-minute address to Full Council on 6 July 2016. We think the meeting has been recorded by Newcastle City Council. We intend to publish Cllr Ged Bell’s reply, should we receive it. Video available here (including Ged Bell’s reply). In the last few years, Newcastle has started to make progress towards constructing a city which is fit for cycling. Cycling is on the agenda, and we are delighted to note that debates are now positive and constructive. We all now appreciate, I think, that cycling is a key ingredient in building an inclusive transport system. Providing an inexpensive and easy way to get around is important, particularly in Newcastle with its struggling health and socio-economic challenges. High cycling levels are an indicator for a thriving, modern and innovative city and one which looks outwards, attracting new people and new businesses. Healthy streets nurture healthy, happy and productive communities and this is achieved by building cycling into the transport system. In recognition of this, it was great to see nearly all of Newcastle’s councillors support Space For Cycling proudly making Newcastle the leading Core City in England. Thank you, this is entirely down to you. But Newcastle cannot afford to rest. We must keep the ball rolling to turn this unique opportunity into real action through cross-party co-operation. Newcastle, our city, is worth it. The economic argument for cycling is clear: Department for Transport figures show that every pound spend on cycling infrastructure is returned at least fivefold and the World Health Organisation tells us that every mile cycled saves our city a pound – current cycling levels already saving Newcastle millions of pounds. So, today, I stand here in front of you with a plea. What I am about to say is based on our campaign’s six years of hard volunteering work, researching, informing and planning cycling in the city. As a Management Committee member of Newcycling, and with its over 1,600 members in mind, I would like to give you our assessment on where we are and propose some next steps. Support for cycleways has never been stronger, but the lack of safe infrastructure must be overcome. This is particularly important when travelling with children, when you are hauling your shopping around with you or if your physical abilities or age become a challenge. A separate cycle space is totally essential for these kinds of journeys. For the 97% of men, women and children who currently don’t regularly cycle, a lack of safe space is the main obstacle. The really good news is that the potential shift towards cycling is massive. The 2011 Census shows that, in Newcastle, 40% of car commutes are short, under five kilometres to be precise, which according to the British Medical Association is a perfect distance for cycling. Addressing that 40% would mean 35,000 cars off the road network. Imagine what could be done with that space! We have to rethink our approach to ‘relieving congestion’, ‘improving junction capacity’ and ‘smoothing traffic’ as one of reducing air pollution through reducing car use. We, as a city, must thoroughly think through the process of transport transition. If we don’t, car use, congestion and pollution will get worse, along with all of the associated health problems and costs to businesses. We also need to remember that 42% of households in Newcastle do not even have a car. We need to provide differently in the future, and we need to provide for the future. Newcastle has started to make plans, but these plans must now grow in their strength and clarity. So, you may ask, what do we need to do right now? 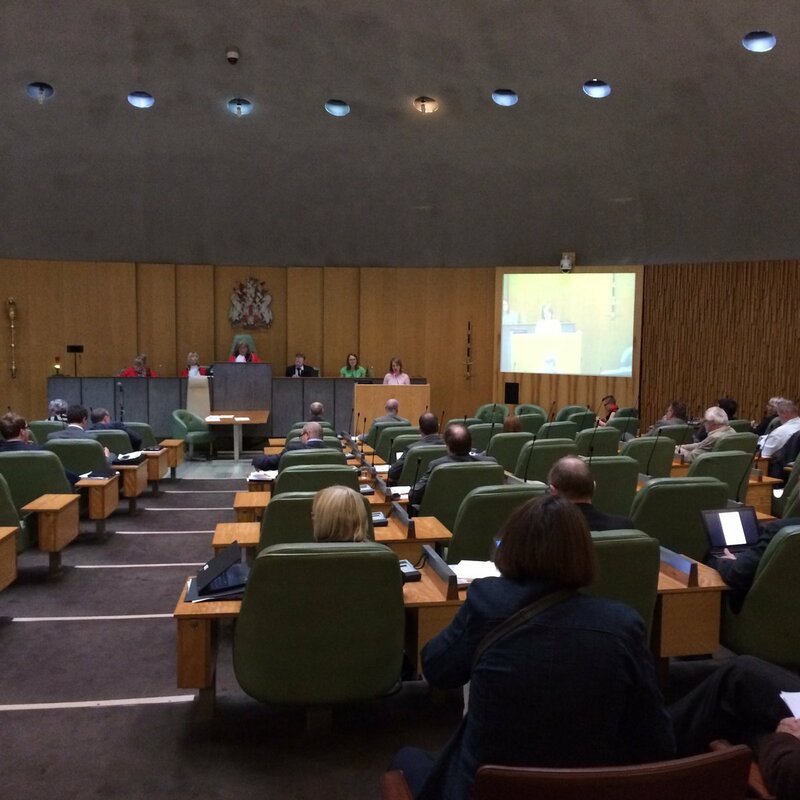 A consolidation of current council statements is overdue. Newcastle needs to build on the Cycle Manifesto, Space for Cycling and cycle strategy, to create a clear and confident vision with an engineering master programme to integrate cycling into Newcastle’s streetscape. Civil servants work to budgets. If a clear budget line existed for cycleway construction, engineers and planners could make much better plans and programmes. The Dutch told Newcastle City Council’s delegates at the Go Dutch conference held here at the Civic Centre in 2013 that we should set aside a dedicated annual budget. Six million pounds a year would meet Dutch levels of expenditure on cycleway construction. The primary interest of housing developers is to make a profit. It is vital that we ensure that Newcastle gets something in return. Newcastle must map out a cycle network to give clarity over developers’ contributions. The cycle network must be adopted into transport policy to give it strength and status. London has made huge strides in building high-quality protected cycleways. This is the result of clear vision, clear budgets and clear design standards. Urban transport needs and problems are quite universal. Newcastle should adopt London’s standards, to help city planners and engineers to design good infrastructure for cycling and better streets for people in general. Newcastle is facing great challenges and needs to make ambitious plans for the future. We suggest that it’s best to do it together. Building on council’s momentum and successes to date, consolidating Newcastle’s vision to become a cycle city is the next logical step. This must be supported by a clear budget line on the council’s balance sheets. We should adopt the London Cycle Design Standards to make it easier for engineers and planners to design the right things. And we must also map and adopt into policy the cycle network, ensuring investment and construction. We are eager to hear council’s response to our proposal. The challenges which come with change are easier to tackle if we work together. Newcastle is a great city. Newcastle would be even greater with a clearly, confidently and collectively mapped out cycling future.